“Come on Scotch” I whisper to the beautiful brown horse I’m riding from Painted Bar Stables in Watkins Glen New York as she gingerly steps around the puddles in the field around us trying to avoid the mud. An American Paint Horse, “Double my Scotch” is named for the drink, not the candy (although the name Butterscotch fits just as well). Scotch has a personality and a mind of her own as she ignores my gentle tug on her reigns and my pleading whispers. She is being a bit of a princess and doesn’t want to get muddy. 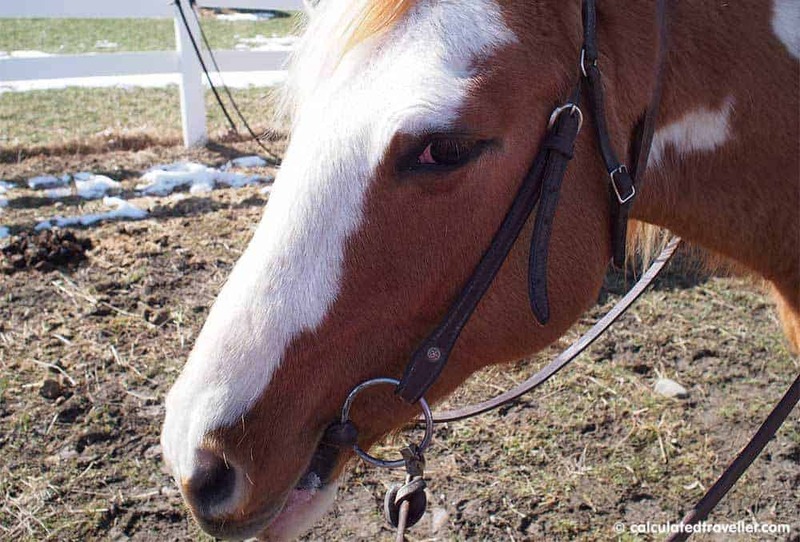 But I also think that Scotch senses that I’m an inexperienced newbie rider because an inexperienced rider is what I am. 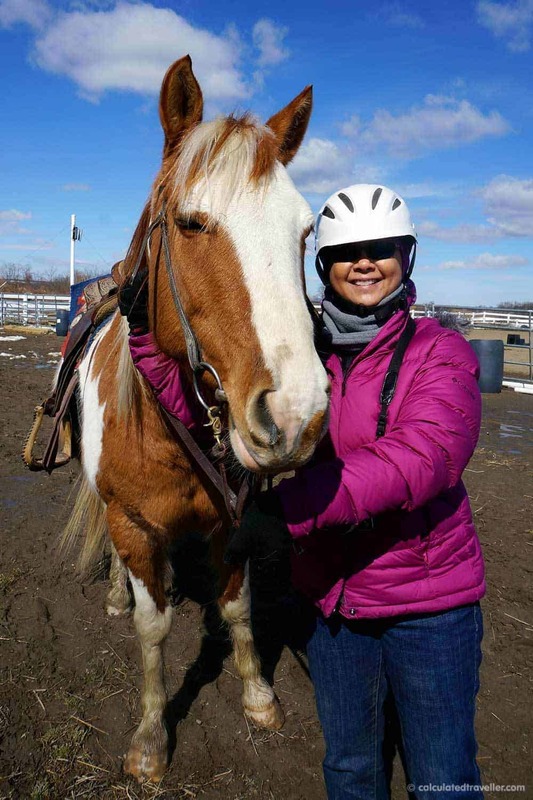 Having learned how to ride a horse moments earlier by my instructor, owner Erika Eckstrom of Painted Bar Stables, this is my first ever attempt at riding a horse and Scotch is entirely correct in her assumption of my abilities. 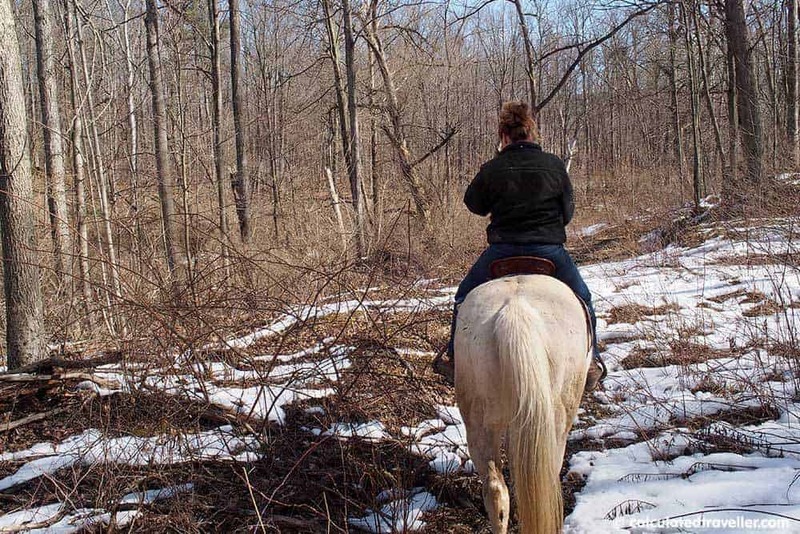 A pro, Scotch can navigate this trail with her eyes closed — I could sit here and enjoy the journey but I’m supposed to be learning how to ride her, and I vow that I will. Erika instructs me to nudge my horse with my knees and to become more direct with my hand movements on the reins and Scotch reluctantly obeys. Gaining confidence in my abilities, we soldier on through the bush. 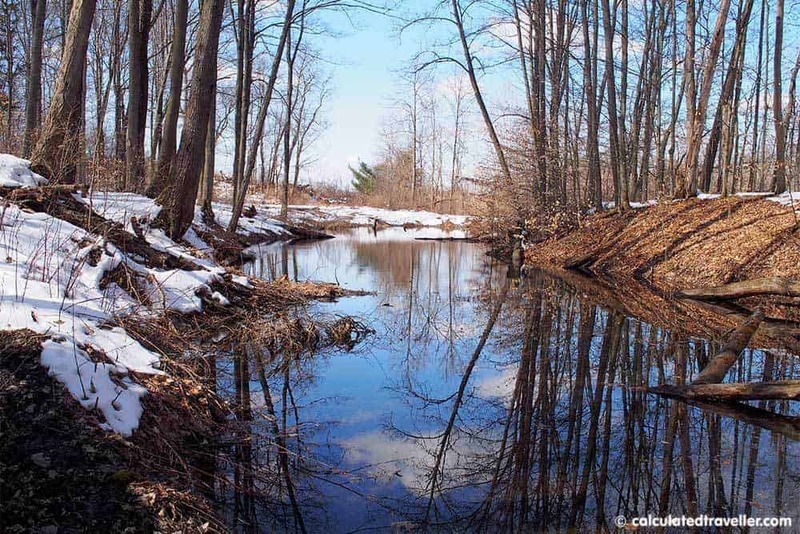 It’s early springtime in Watkins Glen New York or more precisely Schuyler County, and there are still remnants of the snowy winter all around us. There is a chill in the air, and I catch glimpses of my breath, but the cold doesn’t bother me. I’m having a blast and this moment I’m sharing with my new friend Scotch is slowly being etched into my memories with each clop clop clop of her hooves as we explore the surrounding woods. As our exploration of the landscape continues, our confidence and comfort level between rider and horse grows, and we travel up and down the slight hills and manoeuvre around the trees and bush. 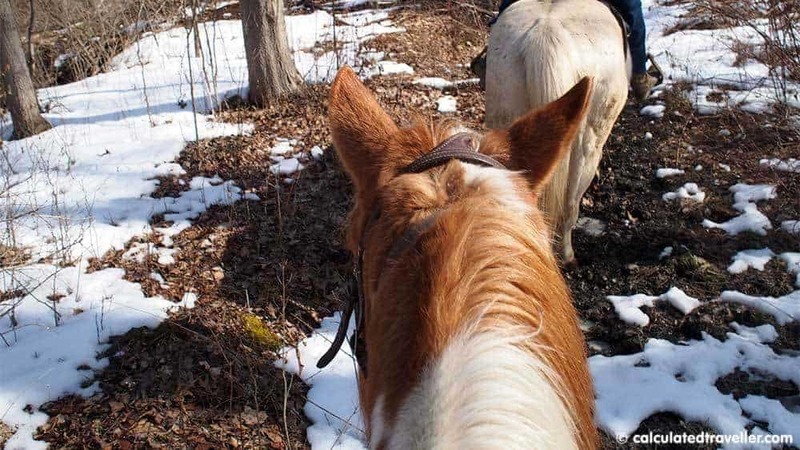 Learning along the way about the other horses that live at Painted Bar Stables, Watkins Glen, Finger Lakes, and Finger Lakes National Forest. As our ride progresses, we stop talking. In silence, we can hear the breathing of the horses mixed with the rustling of the trees in the wind and the distant sound of the nearby stream. It’s peaceful, relaxing and tranquil. 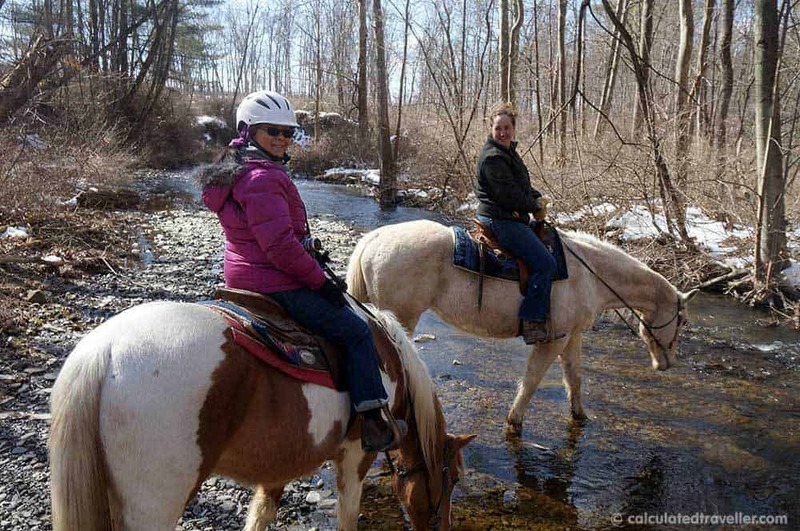 We eventually make our way to the creek so that our horses can have a drink and some rest. It’s a picture perfect moment. The sound of the water as it flows over the rocks in the stream, the slight brush of the breeze on our faces as we sit atop our horses watching them drink the refreshingly cold water. I close my eyes, breathe in the fresh air and savour this moment. Our horses rested and refreshed; we slowly make our way back through the woods returning to the stable and signalling the end of our horseback riding adventure. I stroke Scotch’s beautiful mane, shut my eyes tight and wish like a little girl for a pony of my own for my birthday — wishful thinking for this old city girl. I’ll have to make due with this beautiful memory until I return to Watkins Glen and Painted Bar Stables. 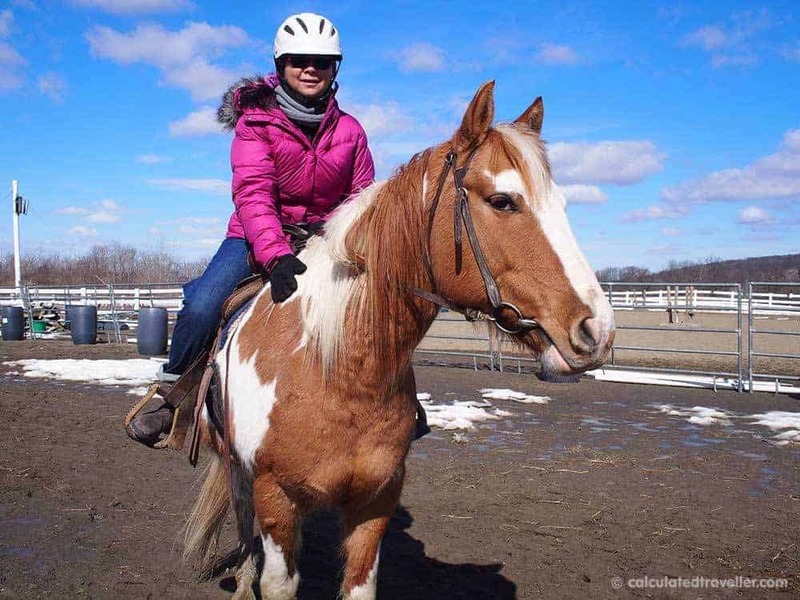 Painted Bar Stables offers year-round horseback riding experiences for all levels of ability or disability, ages 8+. 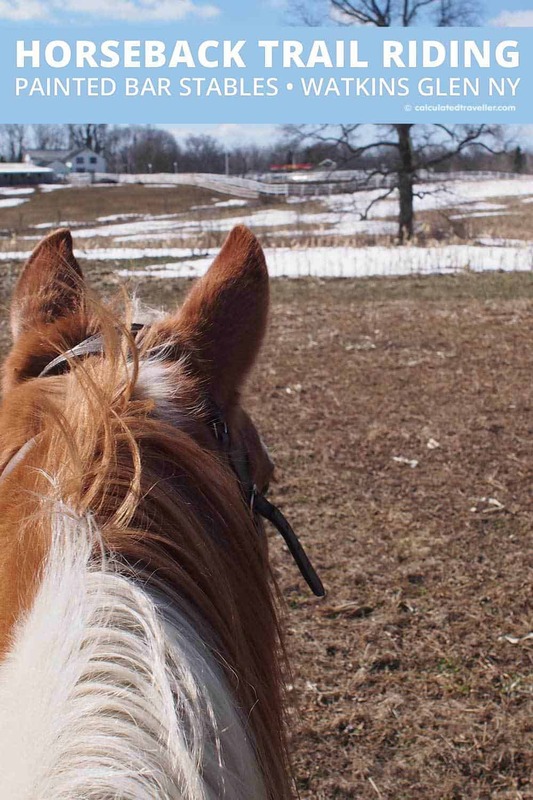 Trail rides vary in length from 1 hour to 3 hours. Speciality rides and overnight pack trips are also available. All instruction, as well as a protective helmet, are provided. – Wear long pants, and long sleeves since you are riding through the woods and want to protect your skin. – Wear close-toed shoes that have a separate heel – so that your shoes don’t slip through the stirrups. – If bringing a camera/cellphone to take photos, ensure you have a strap so that you don’t drop it while riding. – Best to lock up your belongings in your car so that you enjoy the ride hands-free. We stayed at the Watkins Glen Harbour Hotel and found it lovely, comfortable with a view of the harbour. The bonus was that it was a quick drive to Painted Bar Stables. Stay tuned for a feature article of the Watkins Glen Harbour Hotel soon. In the meantime, check hotel reviews on TripAdvisor. Read reviews of Painted Bar Stables on TripAdvisor. I was a guest of Painted Bar Stables which didn’t review or approve this story. Calculated Traveller maintains full editorial control of all content published on this site.